Men's Wearhouse capped a turbulent six-month takeover battle by announcing a deal to buy smaller but older rival Jos. A. Bank Tuesday for $1.8 billion. Men's Wearhouse capped a turbulent six-month takeover battle Tuesday by announcing a deal to buy smaller rival Jos. A. Bank for $1.8 billion. The deal combines the two largest independent men's clothing retailers. It was not an easy combination to reach -- each company has spent much of the last half-year taking runs at the other. 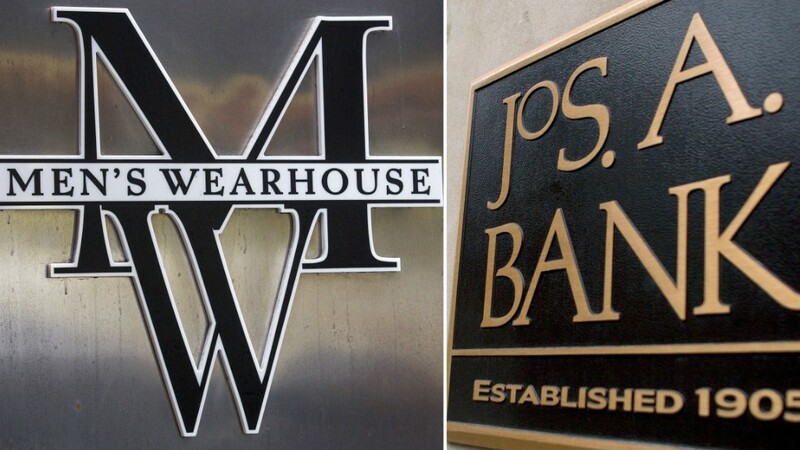 Men's Wearhouse (MW), which has 1,133 stores, will pay $65 a share in cash for Jos. A. Bank (JOSB), which has 629 stores. Both brand names will continue to operate after the deal, and the companies did not announce plans to close any of the 1,700 stores they have between them. Investors have been expecting this deal since the companies agreed to hold merger talks and exchange confidential financial information. Men's Wearhouse offered $63.50 a share in advance of the agreement and said it was willing to go as high as $65 a share. When Jos. A. Bank rejected the $63.50-a-share offer, it said it would be open to being purchased at a higher price. In October, Jos. A. Bank made an unsolicited $2.4 billion bid for Men's Wearhouse, which rejected the bid and quickly responded with its own unsolicited $1.5 billion offer for Jos. A. Bank. Men's Wearhouse raised that offer twice before the current deal was announced. In January, Men's Wearhouse also announced it would nominate two candidates for Jos. A. Bank's board of directors in an effort to put pressure on the company to make a deal. Investors were eager for the two companies to reach a deal. Hedge Fund Eminence Capital, which owns nearly 10% of Men's Wearhouse and nearly 5% of Jos. A. Bank, was on record as saying a merger was in the best interest of shareholders of both companies. Shares of both companies were higher following the announcement. Jos. A. Bank took numerous steps to fight off the offers from Men's Wearhouse. In February, it announced a deal to buy outdoor clothing company Eddie Bauer for $825 million in cash and stock. But with Tuesday's announcement, that deal was terminated. The normally quiet men's clothing sector first started getting attention last spring when Men's Wearhouse took the unusual step of firing George Zimmer from his position as executive chairman. The company's founder, former CEO and largest individual shareholder, Zimmer had also served as the public face of the company. He starred in its commercials, promising customers that "You're going to like the way you look, I guarantee it." Men's Wearhouse said Zimmer was fired because he no longer supported management and was pushing for a sale of the company to a private investor group.